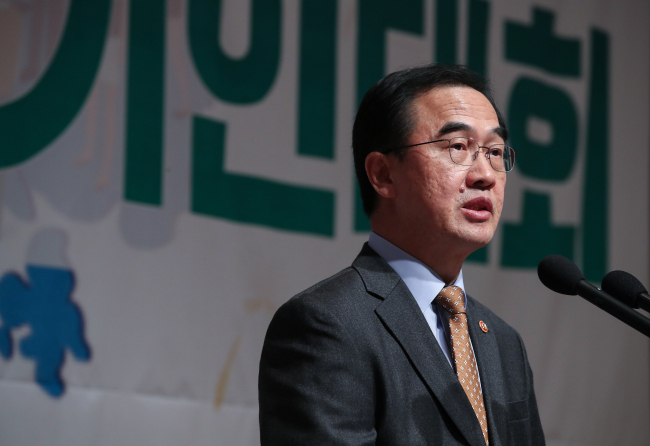 Unification Minister Cho Myoung-gyon will embark on a trip to the US on Tuesday, feeding speculation that Seoul plans to make more direct efforts to create a consensus among US lawmakers and the public on inter-Korean relations. Cho will visit Washington, DC, and New York from Tuesday to Saturday to attend the 2018 Korea Global Forum and meet with US government officials and lawmakers, according to the Ministry of Unification. The forum is hosted annually by the Unification Ministry. Cho is reported to have plans to meet with US Secretary of State Mike Pompeo to exchange views on the recent postponement of high-level North Korea-US talks and to advocate Seoul’s position that improved inter-Korean relations would accelerate the North’s denuclearization. A meeting with Ed Royce, a Republican lawmaker from California and chairman of the House Foreign Affairs Committee, is also being discussed, reports said. Cho’s visit comes amid growing signs of further stalling in Washington-Pyongyang talks on denuclearization. Planned talks between US Secretary of State Mike Pompeo and Kim Yong-chol, vice chairman of the Central Committee of North Korea’s ruling Workers‘ Party, failed to take place on schedule Thursday, with US Ambassador to the United Nations Nikki Haley saying Pyongyang had called off the meeting. Experts said the stalled talks were likely to present more stumbling blocks in the path of inter-Korean cooperation projects, and that the Seoul government was responding by to sending Cho to the US to help create positive sentiment toward inter-Korean relations. “It will be meaningful for the Seoul government to dispatch a minister to explain to the US State Department how progress in inter-Korean ties can (lead to the formation of) a virtuous cycle with the North’s denuclearization,” said Yang Moo-jin, a professor at the University of North Korean Studies. Yang added that Seoul and Washington’s decision to launch a joint working group last month to coordinate their strategy on North Korea issues had likely led the Seoul government to conclude that the timing was right. The move is seen as an attempt to overcome skepticism among US lawmakers and the public about the North’s willingness to dismantle its nuclear program and to reaffirm South Korea’s positive intentions surrounding the issue. The joint group was launched amid growing concerns on the part of the US about discordance between improvements in inter-Korean relations and the pace of Washington-Pyongyang dialogue. While the two Koreas hope to push forward with inter-Korean cooperation projects, the US has reiterated the importance of keeping progress on cross-border cooperation in tandem with steps toward Pyongyang’s denuclearization. The US has also been ramping up pressure against the North, saying international sanctions will remain intact should Pyongyang fail to denuclearize. Cho will also meet with representatives of the South Korean community in the US to explain the Seoul government’s policy toward North Korea and unification.